One of the goals of the initiative is to build a consistent visual identity across documents used for communication and outreach. 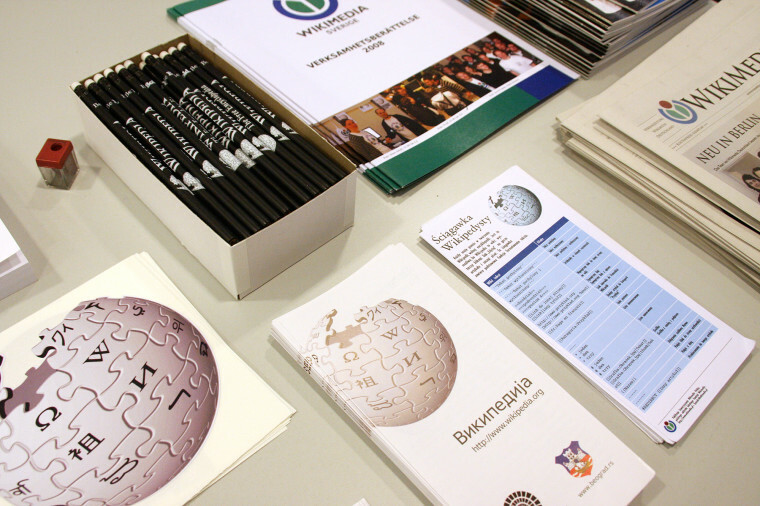 Following the PR material cleanup, I am happy to announce the launch of the Wikimedia documents initiative, which aims at creating and maintaining a centralized set of standardized, up-to-date and localized core reference documents for public relations, marketing and public outreach. The PR material cleanup showed that many documents about PR, marketing & public outreach were scattered across many wikis; as a consequence, they weren't regularly updated. Besides, they often looked very different, not sharing any visual identity. Despite the amount of documents, there was no central place where volunteers could easily find the documents they needed to stage an event or to assemble a press kit for journalists. Last, most documents have been created using expensive proprietary software or fonts. In order to allow for maximum flexibility, dissemination and responsiveness, all the documents produced as part of this initiative will be created using open fonts (mainly the DejaVu family), libre software and open formats. In order to manage the mass of pages and documents, I proposed a naming scheme based on the name of the document and its language. All the existing pages and their translations are now linked from the WMDOC matrix on meta-wiki. It is unlikely that all the documents be translated in as many languages are there are in the matrix; the amount of languages is a consequence of the fact that any language in which a document existed was added to the matrix. Most of the pages linked from this matrix right now are old versions of the documents; they're in the process of being updated. The code of the matrix was simplified in order to facilitate its modification. translators to help localize the documents. To join the initiative, you may leave a message on the talk page of the initiative, join the dedicated group on Identica (!wmdoc) or contact me directly. Wikimedia conference chapters meeting 2009 8895 by Elke Wetzig, under CC-by, from Wikimedia Commons. Is WMDOC being done in conjunction or coordination with Frank's "Bookshelf"? Theoretically, WMDOC’s scope encompasses the documents from the Bookshelf. However, right now, the WMDOC initiative is more about raising understanding about Wikimedia, whereas the Bookshelf is more about increasing the number of editors. There will be some overlap with documents such as the cheatsheets, but Frank and I are in daily contact.